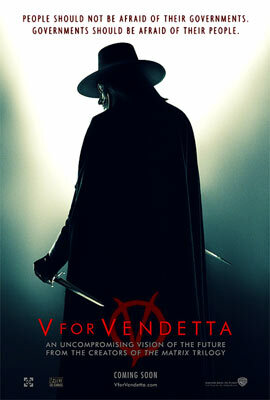 I went to see this movie hoping that it would live up to the hype the commercials laid for it – I was hoping that when the commercials said “People should not be afraid of their governments, governments should be afraid of their people” that this movie would deal with political issues philosophically. I was not disappointed. The movie is an amazing tale of one man who has had enough of his government controlling its citizens and he decides to right the injustice of government acting contrary to its proper purpose – a government should protect its citizen’s rights and create opportunities for them to flourish. A government that acts contrary to its proper purpose is a government that needs only one thing: overthrown. The movie dealt with the issue beautifully and while I can’t give it an unconditional endorsement without seeing it again and knowing more about it and it’s purpose, but I can say that the movie has a lot of excellent points and it most definitely worth seeing. The movie did forcefully remind me of one thing which I sometimes doubt, but which I always hope is true and that is this: the spark in humanity, that infinitesimal kernel of Integrity, of Justice, of Truth, and of Pride, cannot be destroyed no matter how bad the times nor how hard one tries. Even the spark within ourselves cannot be fully extinguished by our actions no matter how bad they are, the only act which can extinguish the spark is death and then the spark can become a conflagration that can consume an entire populace if done by the right person. While the clearest example of this is something fictional like the movie “Braveheart” or this movie “V for Vendetta” – there are historical examples as well. In any age, in any place, no matter how bad things have become, no matter to what depths humanity has sunk, the spark will be there within each and every person…waiting. It doesn’t take any special kind of person to ignite the spark, or rather it shouldn’t have to. The spark is ignited by the simplest act in the world – the simple act of standing up and saying “No!”. All it takes is Integrity, all it takes is Justice, all it takes is to recognize the proper nature of your own humanity and stand up and say “I will be human and there is nothing anyone can do to stop me!” To gain your humanity through your death is tragic, but to gain it instead of living as a sub-human is divine. To see the choice at hand and know that even though death awaits you – you will be human, truly human, if for just once in your life. Remember that spark, the spark which can ignite an unstoppable firestorm of righteous Justice, is within you. No matter how dark the day may get, no matter how far we fall, as long as we are human nothing can stop us and nothing can take that which is most important from us – the divinity of the human spirit.